A mural artist who has just been commissioned to paint in Leeuwarden city centre in The Netherlands is urging Maltese colleagues to get off the island that reveres mediocrity. “I fear that in Malta we hail mediocrity, especially when it comes to contemporary art. Graffiti and street art is not considered an art form by most, and several tend to appreciate conventional art but look down on contemporary work,” James Micallef Grimaud, known as Twitch, said. The artist has just returned from the Netherlands, where street art is not limited to secluded spots but actually promoted, with guided tours specifically organised around urban art pieces. Known for his socio-political art, Mr Micallef Grimaud has left his mark in Leeuwarden, the city that this year shared the European Capital of Culture title with Valletta. While in Malta he painted a crane situated at the ‘Red China dock’ to look like a giraffe as part of a key V18 exhibition, in Leeuwarden he tackled the importance of sustainability in a project organised by Serge Hollander from the organisation Writer’s Block. 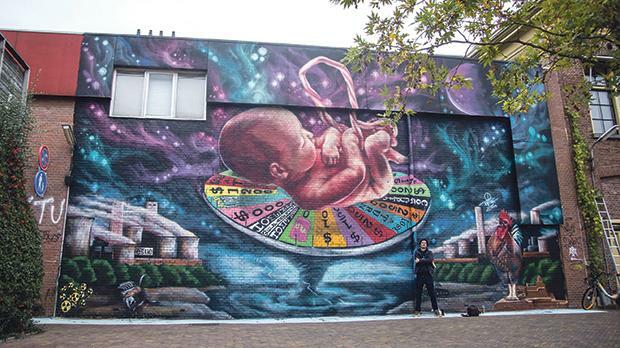 The free-hand mural depicts the unborn child going around on a spin top surrounded by an apocalyptical scenario created by people’s greed which, in some cases, is not too far from reality. “The spin top spins uncontrollably so it is up to us to take care of the world as best we can, ensuring that the unborn child can land in a safe environment,” he explained. For the mural, which took two weeks to complete, Mr Micallef Grimaud was inspired by the socio-political goings-on in Malta but also across the globe, including the issues of pollution and corruption. In Malta, the artist often makes strong statements through his work. Recently, he created a mural at the university skate park illustrating Malta’s tendency to sweep its problems under the carpet. Two vultures – one wearing red, and the other blue boxing gloves – stand on a carpet, under which murdered Daphne Caruana Galizia’s bombed car, Pilatus Bank and Panama Air have been swept. The vultures are meanwhile surrounded by polluted skies and cranes. Despite the apathy that he sometimes comes across, Mr Micallef Grimaud will not give up. Graffiti and street art, he believes, is a form of art that passes on the message to the public in the most effective manner because its canvas is the street. So where does he draw the line between art and vandalism? While in its nature, street art is often removed or covered by other art, he believes that artists should get permission when they intend to leave graffiti on public property. Mr Micallef Grimaud himself seeks permission when necessary, whether in Malta or abroad. The only difference is that abroad he is commissioned to pass on a message while in Malta he funds socio-political art from his own pocket.